Moses was going through the routine of his day when he noticed an ordinary thing: a burning bush. Moses also noticed something extraordinary. Although the bush was burning, it was not consumed. Moses turned aside to look more closely. When the Lord saw Moses turning aside from the routine of his day, He spoke to him. Everything God had been doing for forty years in Moses’ life was culminating in this moment. So much of God’s redemptive plan waited for Moses to notice the uncommon in the midst of the common. There will be times when, immersed in the ordinary details of life, you may be oblivious to the extraordinary that is right next to you. You can be in the midst of a common moment, only this time the activity is filled with the presence of God. There may be times when, in the middle of your harried day, you notice something unusual. Your first reaction might be “I’m too tired to go aside to investigate this!” or “I’m not going to disrupt my life for this.” Yet, in that moment you may have the opportunity for a unique encounter with God. 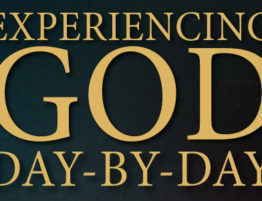 God usually speaks out of the ordinary experiences of life. Often, it is not while you are worshiping at church. Many of God’s most profound and history-changing encounters come during the ordinary experiences of life. When you see the unusual in the midst of the mundane, don’t continue business as usual. It may be that God has ordained that moment to be a life-changing time for you and those around you.